Impressive dessert perfection whipped up in less than 5 minutes! This is my go-to dessert if creativity is taking the day off. As I usually have all ingredients for this in my cupboard, I can whip up this exciting dessert even in case someone drops by unannounced. The combination of cold ice cream with warm chocolate and banana is just heavenly and will even impress the notorious dessert-skipper! Your guests also don’t need to wait long for their delicious treat, as you can dish this up in 3-4 minutes. As it’s done so quickly, it is easiest to scoop your ice cream into the bowls beforehand and then work on the sauce. The banana is cooked in rum and sugary water for a minute to make it nice and soft, before you transform the cooking liquid into a rich and complex chocolate sauce. Any brown rum will do for this dish. Often I use Captain Morgan though, as it has a very nice vanilla flavor to it. If you want to make a kid-friendly/non-alcoholic version of this dish, just replace the rum with the equal amount of water and some vanilla sugar. This dessert is also a nice way to get rid of ripe bananas. The riper the bananas, the sweeter the dessert! It also does not matter if you cut the banana into slices or chunks – both work equally well. Do whatever feels right! You can also go totally bananas (pun obviously intended) and combine the sauce with my peanut banana ice cream recipe! Cook the banana and stir everything together! Divide the ice cream among the bowls. In a small pot, bring the water and rum to the boil. Add the sugar and stir to combine. Slice the banana directly into the cooking liquid and cook for 1 minute. Fetch out the banana with a slotted spoon and divide among the ice cream filled bowls. Remove from the remaining cooking liquid from the heat. Break the chocolate into the liquid and add the cocoa as well as the espresso powder. Give a good stir until the chocolate is fully melted. Drizzle the warm sauce over the cooked banana and the ice cream. 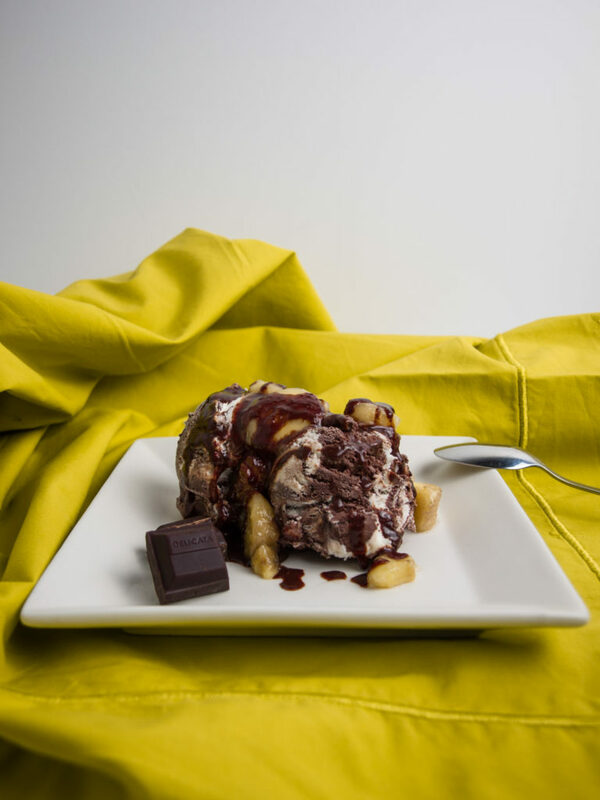 Enjoy the awesome contrast of cold ice cream with delicious warm chocolaty banana! Let me know in the comments what you think of this delicious sauce! It can get quite runny if you don’t work quickly enough but that makes for an even naughtier treat!